John L. Davis, died July 16, 2015, after a valiant fight against cancer. Born May 21, 1947, in Corvallis, he spent his entire life in the community. He graduated from Corvallis High School (class of 1965) and Oregon State University (class of 1969 – Bachelor of Science in Business Administration). 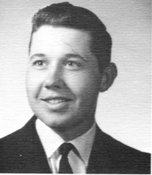 After graduating from OSU, he completed a tour in the US Navy during the Vietnam War (1969-1971) on the USS Hamner. John then entered into the dairy farm and grass seed business established by his father on Bellfountain Road south of Corvallis. Here he could be found working the next 43 years running an operation that included over 400 cows and 500 acres of crops. He was a hard-working family man and great husband to his wife of 42 years, Glenda Davis. In 2003, John and his family added some fun to the family business by establishing the “Muddy Creek Maze.” This became a highlight to John over the next 10 years, seeing the fun that local families had visiting his corn maze creation and pumpkin patch. John always felt that the best part was driving the “moo train” for all the kids and especially his grandkids. John spent many years watching his sons play sports which he loved and participate in Benton County 4-H. In his spare time, he loved being with his grandchildren — always finding time to be at the next activity, attending almost all OSU athletic events, going out for morning coffee with his wife, and enjoying time with family and friends. Surviving are his parents, Leighton and Juanita Davis of Corvallis; wife Glenda Davis; sons Chad Davis and wife Debbie, Curtis Davis and wife Jessica; three grandchildren, Haylee, Keira and Derek; and sister Karen Steele of Corvallis. John will be sorely missed; we were blessed to have him in our lives. A celebration of life will be held at a later time. We invite you to share your thoughts and memories of John at www.mchenryfuneralhome.com. Click here to see John L.'s last Profile entry.